The BExBGL2 L.E.D. 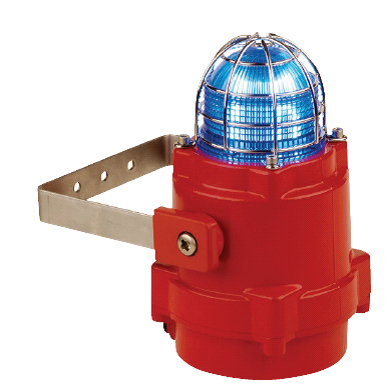 multi-function Explosion Proof Beacons are suitable for Zone 1, 2, 21 & 22 applications. Approved to IECEx and ATEX standards. The BExBGL2 explosion proof LED status light & beacon utilises an array of high power Cree® LED’s, orientated to optimise visibility in any direction. The beacon can be configured as a steady beacon for status indicator use, with a light output of up to 87 candela. Alternatively one of the five flashing modes, with a light output of up to 160 candela, may be used for warning applications. DC voltage versions feature three remotely selectable stages enabling multiple warnings to be signalled from one device. The UV stable colour filter enhances the light output and is field replaceable. – 3 stage alarm, remotely selectable (DC version only)..
– Light Intensity: 160cd(e) – flashing. – Flash Rate: 7 flash patterns (see table below). – Temp Rating (degrees Celsius): T6 -50 to +60, T5 -50 to +70. – Approval: II 2G Ex d IIC T6 (max ambient temperature +60 degrees Celsius), II 2G Ex d IIC T5 (max ambient temperature +70 degrees Celsius). – Weight: DC – 2.65kg, AC – 2.95kg. ESS7711 10-50VDC, 24mA @ 24VDC. ESS7721 115VAC +/- 10%, 95mA. ESS7731 230VAC +/- 10%, 48mA.